An itinerary to discover Bangkok through its most representative temples and buildings, sailing along the river and a show portraying its history and traditions without forgetting a spot of night-time shopping. 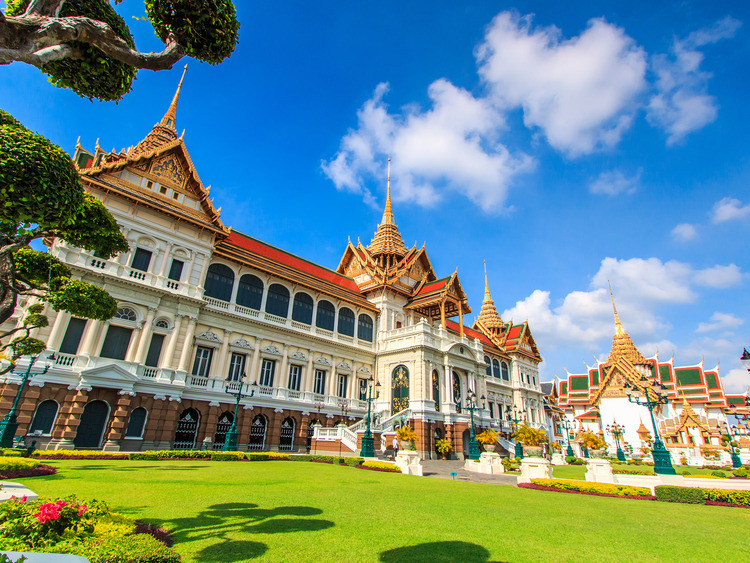 Our excursion to discover Bangkok starts with a visit to the Grand Palace complex, home to the magnificent Golden Buddha Temple (Wat Phra Kaew), considered the most sacred Buddhist temple in Thailand. The temple is made up of various buildings: the boths, i.e. sanctuaries where ceremonies are performed and Buddha effigies are displayed, the viharas, i.e. public prayer halls, the mondhop, i.e. the library where the sacred texts are kept, and the stupas, i.e. sacred buildings that are narrower at the top just like bells. Inside the main temple (Phra Ubosot), we find the sacred statue of the Emerald Buddha, a green jasper statue 70 cm tall depicting a sitting Buddha adorned with golden robes that are changed three times a year in conjunction with the Thai seasons during a solemn ceremony performed by the Monarch himself. Still inside the 1,900 metres of walls surrounding the complex, we can also observe the Grand Palace, commissioned in 1782 when King Rama I decided to move the capital from Thonburi to Bangkok. Our excursion continues with a thrilling trip along the Chao Phraya river (the River of Kings) - a fascinating cruise that enables us to admire city life on both banks. Lunch awaits us at the end of the visit. Later you will have some free time for shopping at a local store before driving to the amazing Reclining Buddha Temple, with 3rd largest reclining Buddha image being housed. We then head back to our coach to reach Siam Niramit, where we will enjoy a unique experience: a delicious buffet dinner with local and international dishes followed by a magnificent show. The show depicts the history and traditions of Thailand with colours, amazing set designs that include waterfalls and canals, singing and dancing. Before this thrilling day comes to an end, we have some more time for a spot of shopping in the night-time market. Once we have finished, will return to the ship. Here is limited availability of English-language guides. The coach transfer from the port to Bangkok takes approximately 2 hours. It is not permitted to use cameras during the show. They must be left at the theatre entrance.